Give the gift of variety with an Assorted Cookie Gift Box! Choose the diet style, occasion and include your personal message. 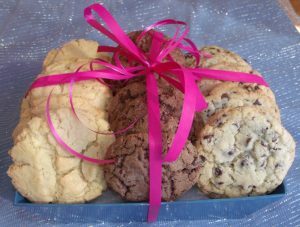 Assorted Cookie gift boxes contain 6, 12, or 18 fresh baked cookies and a minimum of 3 different flavors. D’s Most popular assorted cookie gift box may contain old-fashioned, gluten free, or vegan cookies.